VAS 10 treats the foreign exchange differences by two stages: during initial stage or construction stage then during the course of business. In VAS 10, foreign exchange differences during the construction stage are deferred on the balance sheet account. After the assets are put into operation, foreign exchange differences are capitalized over a period of three years. All foreign exchange differences occurring during the course of business are treated in the income statement in the same manner as in IAS 21. The rationale behind this treatment is many foreign invested enterprises which is start-up in Vietnam having loans in foreign currencies with the banks. Foreign exchange differences resulting from such transactions, particularly in the context of unstable foreign exchange rates in Vietnam , are substantial and significant. 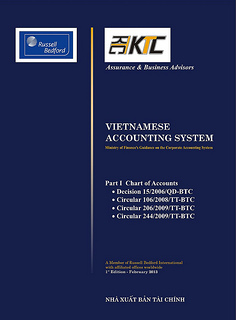 For the disclosure purpose, it's required in the regulated chart of accounts in VN GAAP to disclose foreign exchange difference gains and losses separately in financial income and financial expenses, respectively. Ø Realized and unrealized foreign exchange differences are deferred on the balance sheet and amortized over a period of five years. Ø All unrealized and realized exchange differences are recognized in the profit and loss account. Foreign exchange gains and losses are separated for disclosure in the profit and loss account.